10 Tips for the Nordstrom Sale + Nordstrom Giveaway!! Happy Hump Day ladies! I am a new Auntie, to the cutest litte bundle in the whole world, may I add! If you don’t believe me go check out my InstaStories, and see for yourself. I could go on all day about Xavier, but it is time to start talking about the Nordstrom Anniversary sale dates, tips and tricks and what makes this sale different from all the others. 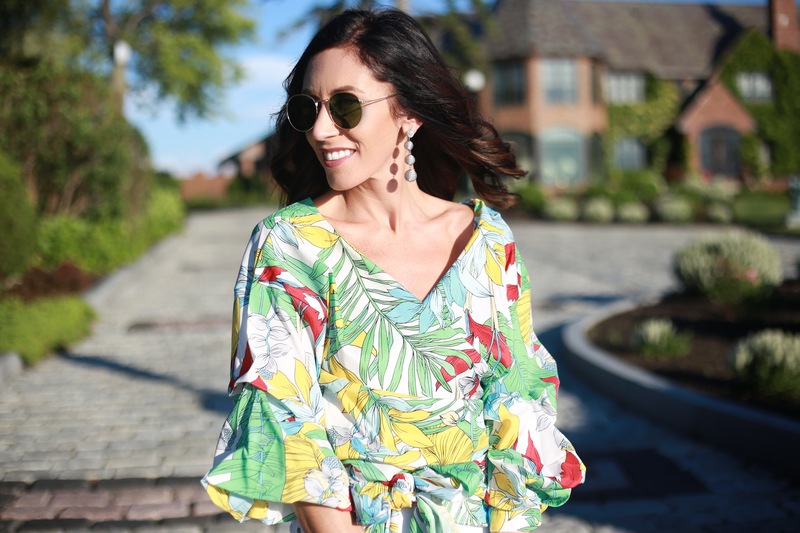 Before I start talking all about the Nordstrom Anniversary sale, I wanted to show you this cute top that makes me want to sip margaritas (I don’t drink, but if I did) and salsa dance the night away. The combination of bright colors, fun print and fuffy sleeves makes this the perfect top for any party or event! I mean, how stinking cute is this look?! Now, lets talk about the real reason you are here. The Nordstrom Anniversary sale dates have been released, and the catalog should be arriving at your doorstep. Can we all do a little happy dance, cause everyone loves a Nordstrom sale! If you have an Instagram account and follow any bloggers, I can promise you that the #Nordstrom and Nordstrom Anniversary sale posts will be flooding your inbox. Every blogger eats, sleeps, and breathes this sale. I know I am ready to shop the best sale of the whole year, but the question is, ARE YOU?! 10 tips & tricks for shopping the sale, and the Nordstrom Anniversary sale dates you NEED to know! 2. You can sign up for a Nordstrom credit card any time from now to july 13th to be able to shop the early access. If you dont want another credit card, you can apply for their debit card that is linked right to your checking account. 3. What makes this sale so special? This sale isn’t last years items marked down, nor is it spring and summer pieces. The #Nordstrom sale is new fall launches that are just being released. 4. You can shop this sale during the Nordstrom Anniversary sale dates online or in-store. In store they will bring you to a private section, or roped off area to shop. Remember a Nordstrom credit card or debit card is a must to gain early access. 5. What will I find at this sale you ask? The Nordstrom sale has women, mens, kids, home decor and beauty. So I guess a better question would be, what can’t you get? 6. Apply and get approved by july 9th for the Nordstrom card. You will recieve a $20 Nordstrom Note to use during the Nordstrom Anniversay sale dates. 7. To shop the early acces Nordstrom annivesary sale dates you need to be a cardholder, but you can still recieve a Nordstrom Note by signing up for Nordstrom Rewards for a $10 note. It is a loyalty card that you accummilate points on. 8. A tip for all you shoppers out there, these items sell out FAST, I mean really fast. Undecided on a color or size, grab them both! Nordstrom has the best return policy. 9. Keep checking everyday, or even every few hours (kinda serious) if something you like is sold out or not available in your size. Things are constantly being restocked and returned during this sale. 10. PLAN, PLAN,PLAN! They dont just go in and wing the Super Bowl, am I RIGHT? They plan every play, and girls, this is our SUPERBOWL! The Nordstrom Anniversay sale begins July 13 th for cardholders. I will be uploading a few more posts prior to the sale, so make sure to follow me on Instagram for updates. If you have any tip or tricks, please add them in the comments! My blogger besties and I have teamed up to bring you a Nordstrom Giveaway just in time for the Nordstrom sale. One lucky reader will win a $1,000 gift card to Nordstrom. To enter, please use the widget below.